Vastly improved sprinter Hello Kelly made it three wins on the trot tonight when she led throughout to win over 405m. The daughter of Shakey Jakey relished outside draws at her previous two starts when victorious in 22.96 and 23.06. Tonight she matched the mustering power of Tyson Gundi (box 7) and drove clear leaving the back straight, scoring in a very fast 22.64. Tyson Gundi was the runner up beaten 2.25 lengths and a length away third was Bago Coops who made up many lengths after his usual moderate getaway. Hello Kelly is owned by Rodney Affleck and is trained out of Southern River by Wayne Beamish. She has only managed 1 win from her first 20 starts but has now won 5 of 25. 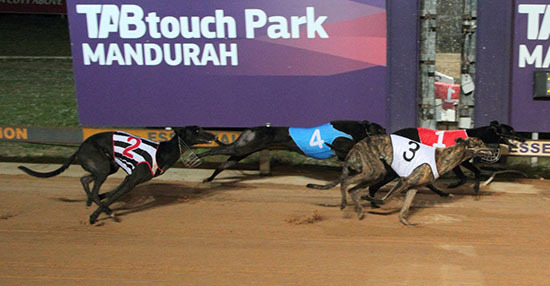 Race 2 Number 4 SPARKY ROY : Dominated from ‘go to whoa’, leading throughout over 302m in 17.17. Race 3 Number 5 SUNSET MOO MOO : Caught the eye with a fast finishing second after pushing through traffic at the first turn.